On Portsdown Hill at the junction of Portsdown Hill Road, Monument Lane and Nelson Lane. CONSECRATED TO THE MEMORY OF VISCOUNT LORD NELSON. BY THE ZEALOUS ATTACHMENT OF ALL THOSE WHO FOUGHT AT TRAFALGAR TO PERPETUATE HIS TRIUMPH AND THEIR REGRET 1805. FOUNDATION STONE LAID JULY 1807. In 1799 a second proposal was made and this was supported by Lord Nelson himself. A committee including the Duke of Clarence and the Prime Minister worked towards the erection of a national monument of 'British Glory and Pre-eminence', An expensive design was commissioned but nothing happened until 1805 when Nelson died at the Battle of Trafalgar. By 1809 the project had been abandoned. Unlike the first two proposals the third succeeded and a monument was built. The main reasons for this was that it was to be dedicated to Nelson, was to be paid for by the navy itself and that it was situated at a very specific point on Portsdown Hill where it could act as a Seamark for vessels coming into Portsmouth Harbour. The driving force behind this project was Captain Thomas Francis Freemantle of HMS Neptune, which had been the third ship in Nelson's line at Trafalgar. Joining him on the committee were three more captains, Henry Bayntum of HMS Leviathan, George Hope of HMS Defence and Francis Laforey of HMS Spartiate. 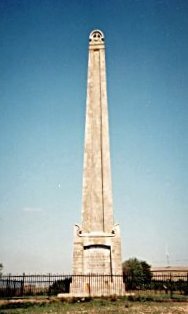 Work proceeded quickly and by 19 November 1808 Captains Freemantle and Bayntum could inspect the monument, complete apart from the inscriptions. The monument was designed by Thomas Groves, an architect who already held a number of official posts. Groves proposed an unusual design for the column, it being influence not by the classical styles of Greece or Rome, but modelled on a style of architecture from Ethiopia. It is suggested that it was copied from a drawing of a stelae, made in Axum, Ethiopia by Henry Salt who was there at times between 1802 and 1806. Salt was brought back to England aboard HMS Neptune by Captain Freemantle who it transpired was returning home with £3000 for the construction of a monument. It is not unreasonable to assume that the two men would have spoken at length and that Salt's drawings may have been produced. The siting of the monument as a Seamark was proposed by Captain Bayntum who determined it's position by sailing to St. Helen's mapping the shoals as he went and then calculating which site would make it most helpful to mariners. By the 1840s the monument was appearing on charts and in manuals where it was described as being "...painted red and white perpendicularly in order to render it more conspicuous." In it's final incarnation the Ethiopian column sits upon a classically styled pedestal with ideosyncratic corners. It is surmounted by a funerary bust of Nelson, attributed to John Bacon Junior though there is no evidence to support this.